Paul got off the elevator on the 40th floor and nervously knocked on his blind date's door. She opened it and was as beautiful and charming as everyone had said. "I'll be ready in a few minutes," she said. "Why don't you play with Rollo while you're waiting? He rolls over, shakes hands, sits up, and if you make a hoop with your arms, he'll jump through." The dog followed Paul onto the balcony and started rolling over. 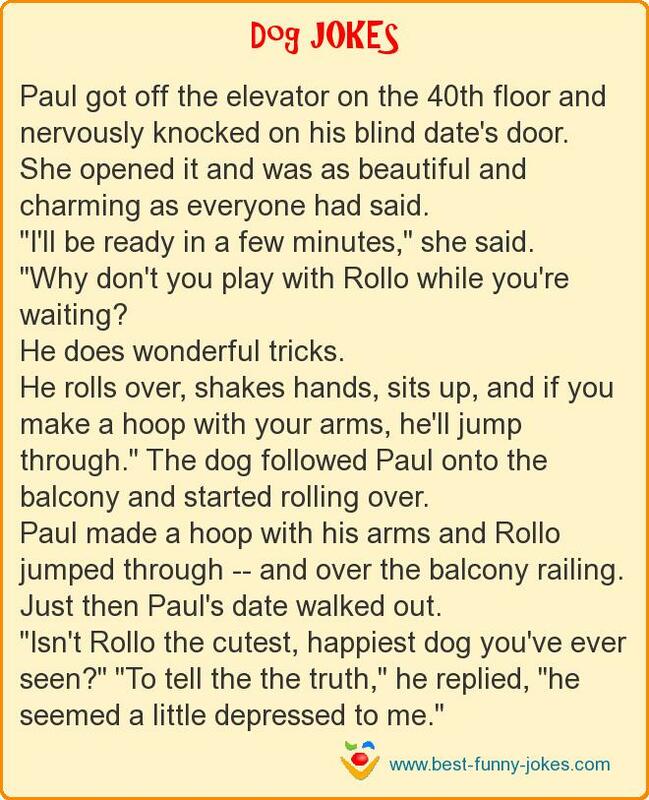 Paul made a hoop with his arms and Rollo jumped through -- and over the balcony railing. "Isn't Rollo the cutest, happiest dog you've ever seen?" "To tell the the truth," he replied, "he seemed a little depressed to me."